Blue Gene Baby . . . . . . .
Shall I mourn your decline with some Thunderbird Wine and a black handkerchief? Who, who, who slapped John? just because . . . . . . . . .
On this day in music history: May 4, 1956 - “Be-Bop-A-Lula” by Gene Vincent And His Blue Caps is recorded. Written by Tex Davis and Gene Vincent, it is the debut release and biggest hit for the rock & roll band fronted by lead singer Gene Vincent (born Vincent Eugene Craddock). Co-written by Vincent and his manager radio DJ “Sheriff Tex” Davis, the pair demo the song, and Davis helps the singer secure a record contract. 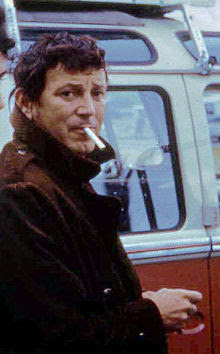 Hollywood, CA based Capitol Records, in search of “the next Elvis Presley” eagerly sign Gene Vincent. Vincent’s band, The Blue Caps, consist of Willie Williams (rhythm guitar), Jack Neal (upright bass), Dickie Harrell (drums) and Cliff Gallup (lead guitar). The band record the track at famed country music producer Owen Bradley’s Quonset Hut studio in Nashville, TN. Released a month later, “Be-Bop-A-Lula” peaks at #7 on the Billboard Best Sellers chart on July 28, 1956, #8 on the R&B chart, and #5 on the C&W chart, selling over two million copies. The band also perform the song in classic rock & roll film “The Girl Can’t Help It”, released later in the year. The seminal recording becomes one of the definitive examples of rockabilly music, and goes on to influence many musicians over the years including The Beatles, The Animals and rockabilly revivalists The Stray Cats not to mention Ian Dury and The Blockheads (see above). “Be-Bop-A-Lula” is inducted into the Grammy Hall Of Fame in 1999.